After the U.K. election results started trickling in last week, I decided to hop in a small short GBP/NZD position when a hung parliament became evident. Think I should add to my position? This pair has been treading in a descending channel visible on the 1-hour time frame and was testing the mid-channel area of interest right around the U.K. elections. Price breached the support zone right when the numbers were enough to confirm that the Conservatives wouldn’t be able to secure parliamentary majority. That’s when I decided to short at market, right when the pair also broke through the 1.7700 major psychological support. I only risked half my usual amount for that one, so I could still have a chance to add on a pullback or another sharp break lower. It looks like bearish vibes are still in play for the pound with the ongoing political uncertainty, but the U.K. currency has gotten a boost from stronger than expected inflation reports. The BOE is set to have its monetary policy statement later this week, which means that additional volatility could come into play. No actual rate changes are expected from Governor Carney and his group of policymakers this time, but it’s worth noting that BOE member Forbes has been calling for a hike on rising inflationary pressures. However, BOE officials might choose to focus on the repercussions of the hung parliament on Brexit negotiations and maintain that stimulus should be kept in place for much longer. Meanwhile, the Kiwi has been one of the strongest performing currencies for the past few weeks thanks to upbeat fundamentals in New Zealand. The country is set to print its Q1 GDP reading before the end of the week and analysts are projecting a 0.7% expansion, higher than the earlier 0.4% growth figure. 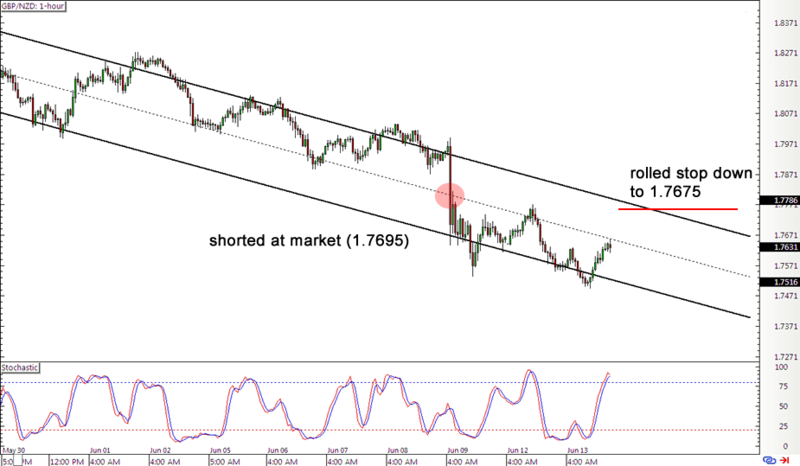 Short GBP/NZD at market (1.7695), initial stop at 1.7925 rolled down to 1.7675, PT at 1.7075. I’ve risked 0.25% of my account on this setup so there’s room to add. By trailing my stop slightly below entry, I’m locking in 20 pips or a 0.02% gain. If this position winds up getting stopped out, I’ll be on the lookout for a chance to short again at the very top of the channel. After the U.K. election results started trickling in last week, I decided to hop in a small short GBP/NZD position when a hung parliament became evident. Stopped out on a pullback! I do wish I had been able to stay longer in this short trade, but the positive developments in the U.K. led me to doubt that the selloff could continue.